oeGOV is making and publishing W3C OWL ontologies for eGovernment. This initiative is born out of the idea: "Use small OWL ontologies to model recovery and deploy across all government" posted at TheNationalDialogue.org and Tim Berners-Lee's vision of "Linked Open Data". Why build ontologies for eGovernment? citizen awareness and appreciation of government initiatives. oeGOV is an initiative started by TopQuadrant. As far back as 2003 we have been building ontologies for eGovernment. TopQuadrant was co-organizer of the first eGovernment conference at the White House Conference Center on the importance of Semantic Web Technologies for the sharing of data using the web infrastructure. The first eGovernment ontologies were the FEA Ontologies. Currently the focus is on ontologies of Government, datasets of US Government branches, agencies, departments, offices and state governments, and an ontology of data.gov. oeGOV invites others to participate in these efforts. We are keen to have participation from US Government Agencies. Where can I access the oeGOV Ontologies? The first set of oeGOV Ontologies were published at the oeGOV blog site this site on August 1, 2009 - "Data Independence Day". oeGOV is made up of schemas and several datasets. The Ontology Architecture is based on Modular Component Ontologies using "Named Graphs". See this post for more details. A consistent convention has been used for Names and Identifers, as documented on the "Guidelines" page. OWL Extensions to the Creative Commons RDF (cc). The Government Core (gc) Ontology establishes a foundation for all oegov ontologies. The FAO geopolitical ontology facilitates data exchange and sharing in a standardized manner among systems managing information about countries and/or regions. Level 1 Ontology about Government. Level 2 Ontology about Government. Imports 'geopolitical'. Level 1 Ontology about the U.S. Government. Level 1 Ontology about the U.S. Constitution. Level 1 Ontology about the Department of Homeland Security (DHS). Level 1 Ontology about The Department of Commerce (DHS). Level 1 Ontology about The Department of Energy (DOE). Level 1 Ontology about The Department of Interior (DOI). Level 1 Ontology about The Department of Justice (DOJ). Level 1 Ontology about The Department of Labor (DOL). 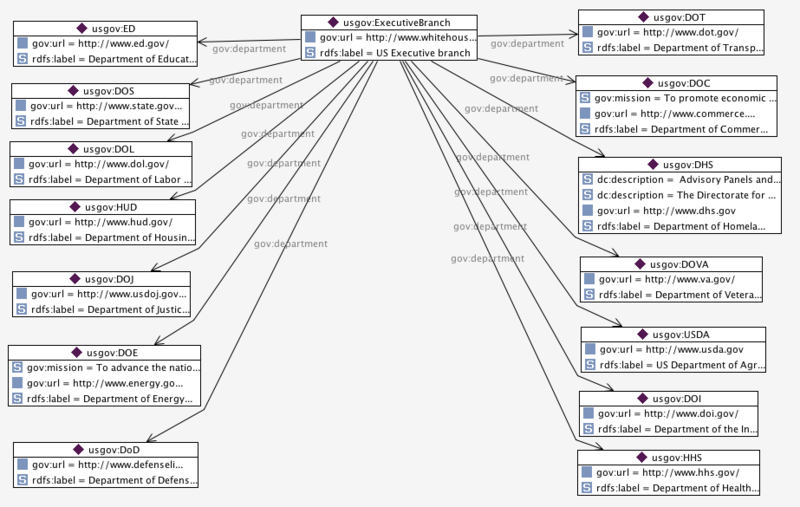 Level 1 Ontology about The Department of State (DOS). Level 1 Ontology about The Department of Transport (DOT). Level 1 Ontology about The Department of Education (ED). Level 1 Ontology about The Environment Protection Agency (EPA). Level 1 Ontology about the General Services Administration (GSA). Level 1 Ontology about The Department of Health and Human Services (HHS). Level 1 Ontology about The Department of Housing and Urban Development (HUD). Level 1 Ontology about The National Archives Administration (NARA). Level 1 Ontology about National Aeronautics and Space Administration (NASA). Level 1 Ontology about National Oceanic and Atmospheric Administration (NOAA). Level 1 Ontology about the Treasury (TREASURY). Level 1 Ontology about the U.S. Department of Agriculture (USDA). Level 1 Ontology about the Veterans Affairs (VA). Level 1 Ontology about the Whitehouse (WH). An aggregation graph is used to collect a set of ontologies together in one merged graph. Level 1 Aggregation of Civil Agencies. The following image shows the class 'gov:Body' and some of its sub-classes and associations. Some 500 US Government bodies have been represented in OWL. The image below shows the Departments of the US Executive Branch.